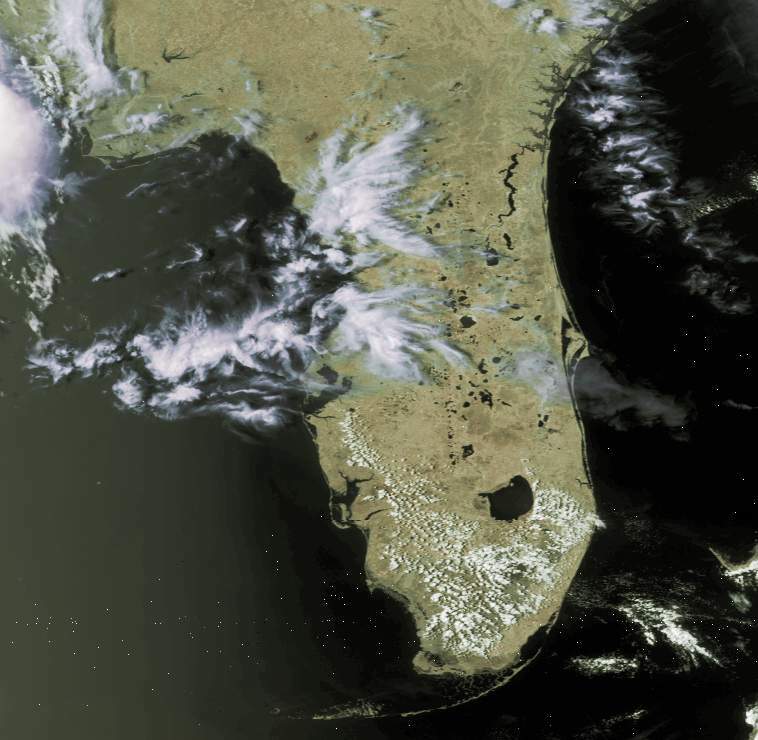 You will find HRPT images on a variety of Web sites, including that of Michael Wienzek and Maurizio Bertolino. Here are some samples, part of a larger image, just to whet your appetite. 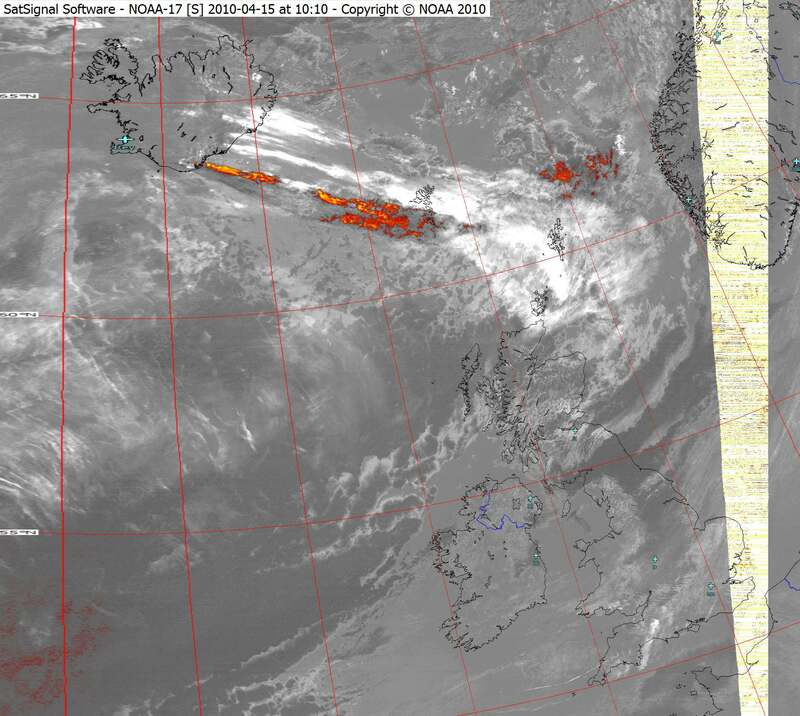 These images were produced with the HRPT Reader available on this page. 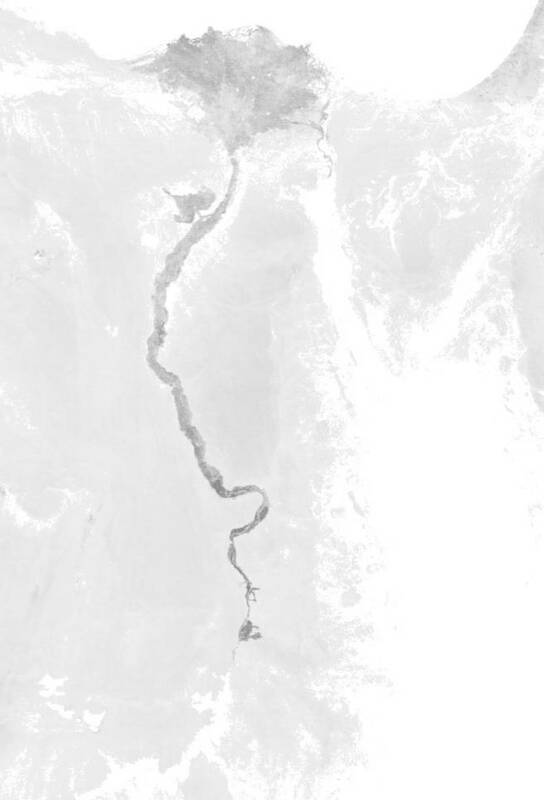 As an example of the sort of processing you can do, I have provided an example of vegetation extraction using a local area coverage (LAC) pass raw data from the NOAA CLASS facility formerly the Satellite Active Archive. 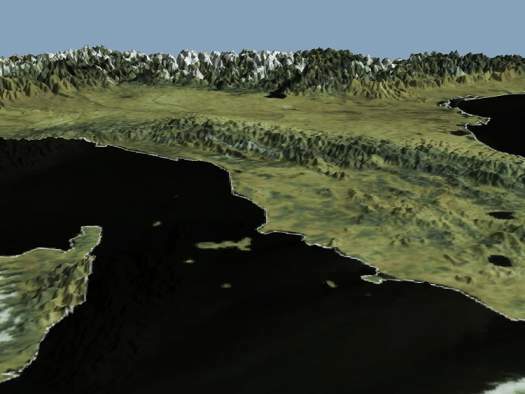 It shows Egypt as a false-colour thumbnail, and a close-up. If you want to play with some raw data yourself, follow these instructions and get some data from NOAA's CLASS facility. The rest of this page may take a few moments to load as there are a number of large images. 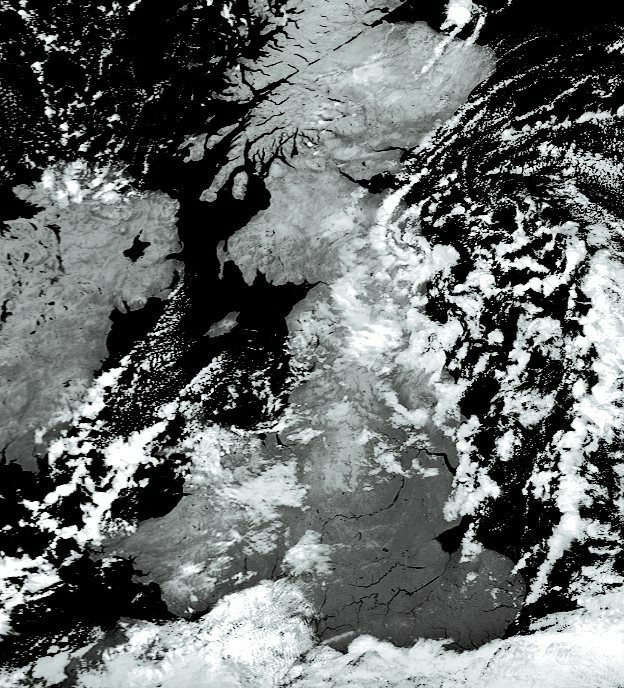 ... and its HRPT equivalent! Even though the sun is very low in the sky in January, thus producing good shadow detail, the histogram equalisation capability of the HRPT Reader enables the maximum use to be made of the 10 bits of video data from the AVHRR scanner. 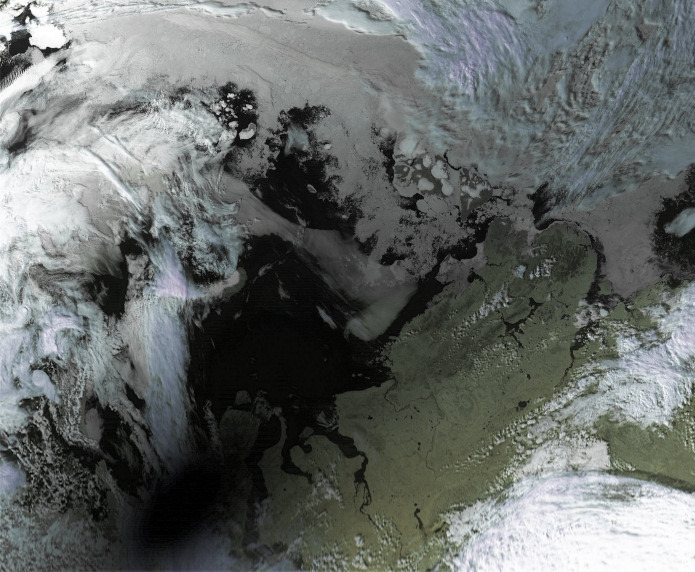 The total solar eclipse on 2008 August 01 was captured on the extreme edge of a Metop-A pass. I have processed the Metop-A data in my HRPT Reader program to bring out the moon's shadow in the image, and cropped and rotated the image by 90 degrees in Paint Shop Pro so that it is approximately north-up. The moon's shadow can be seen at the lower-left of the image, and may look elongated because of the very high latitude of the ground. I estimate the centre of the shadow to be at 66.5 E and 69.5N, which is in the Yamal Peninsula, and timed around 10:11:20 UTC. 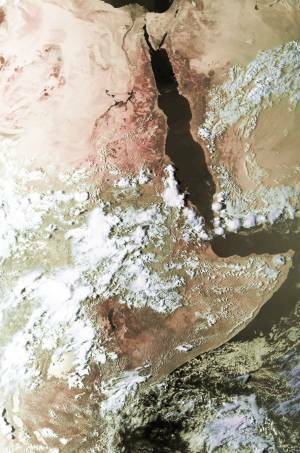 My thanks to Mike Jupp for discovering the Metop pass. 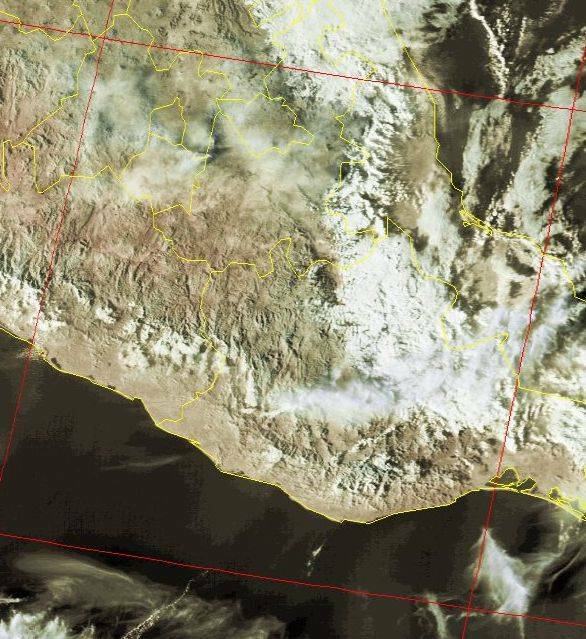 Metop data copyright (c) EUMETSAT 2008. Here are some images from 2009 June 16 showing an eruption of Sarychev Peak, which is in the Kuril Islands east of Japan. I've processed the data in three ways: a "classic" RGB:124 mapping (where the ash shows as purple and the clouds as yellow and land green, my own False-Colour algorithm which uses a visible channel for brightness and a thermal channel for colour, and a difference of the channel 4 and channel 5 (10.8�m and 11.8�m) brightness temperatures processed to show the volcanic ash. 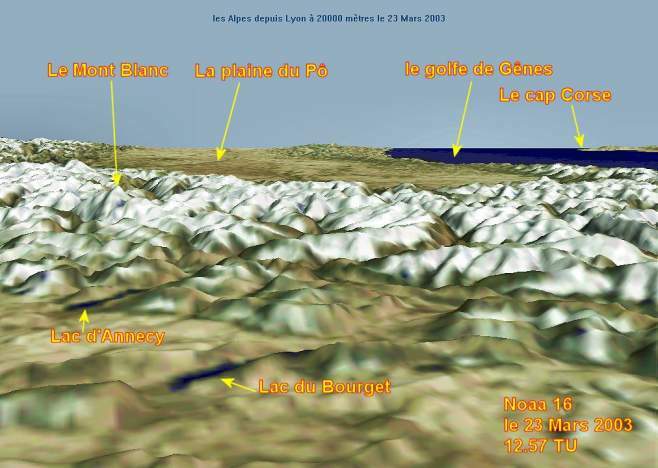 Metop data copyright (c) EUMETSAT 2009. 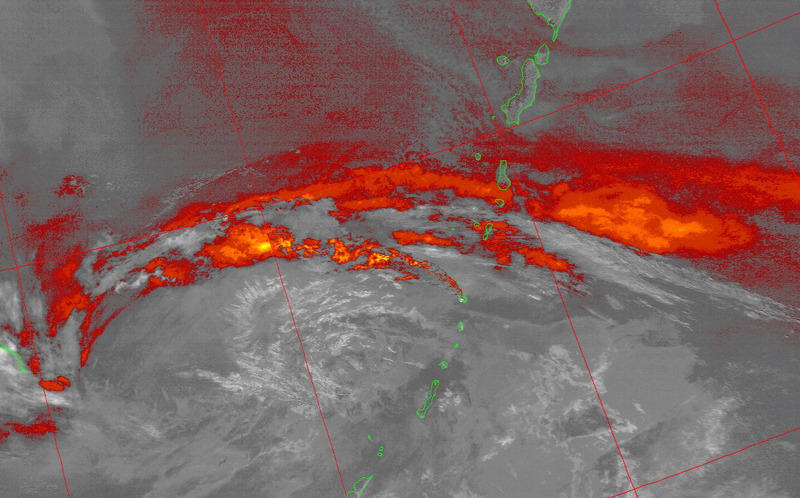 This is a false-colour image from NOAA-17, derived from differencing the two far-infra-red channels, with a colour palette applied to emphasise the volcanic ash/dust. 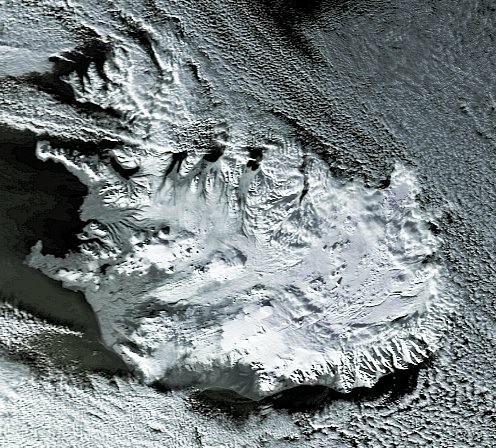 The yellow band on the right-hand side of the image is caused by a satellite problem. 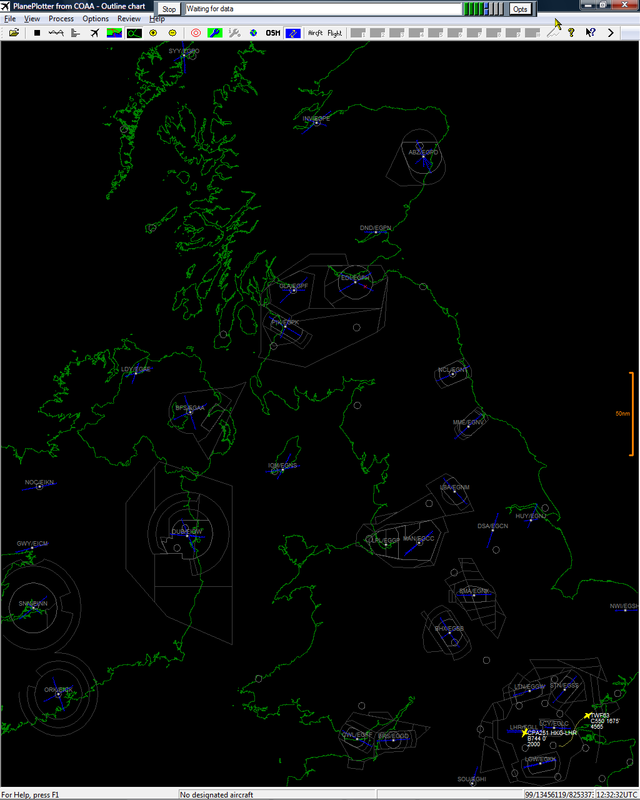 Plane Plotter view around 12:30 UTC (13:30 local) - PlanePlotter is software you can download and buy here. Using my extra GroundMap program to geographically rectify the output from the HRPT reader, you can produce some stunning effects by using the 3DEM 3D Terrain Visualisation and Flyby Animation software with the image. Here are some results of this technique. The method was described in the RIG Journal 72 by Ed Murashie, to whom many thanks are due. You can even make an animation showing what it would be like flying over the terrain! There is an online tutorial available on Mike Long's Web site. The southern part of the UK was subject to heavy floods just at the start of 2003 which caused disruption over much of England, with the Midlands and East being particularly badly affected. The infra-red image below shows rivers swollen to an extent that I do not recall seeing before. The land is colder, and therefore lighter, than the water in the rivers and sea, so that the rivers show up as dark lines. 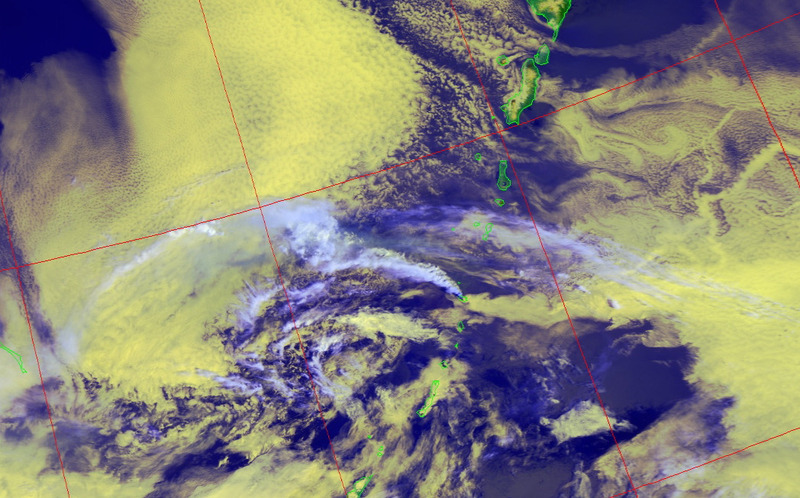 This image is from NOAA-17 at 21:07 UTC on 2003-Jan-03. 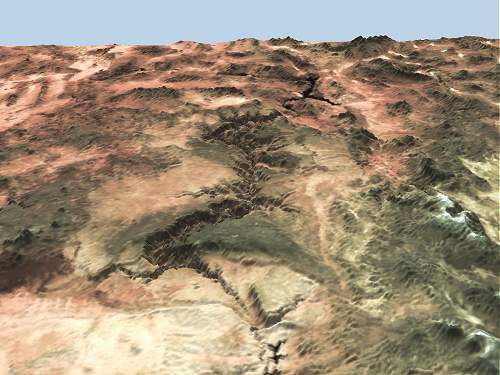 The dark, fertile area is clustered around the Nile - resolution about 1.1km per pixel. Image of a volcanic ash cloud from this active volcano. See here for more information. This image shows the gridding capability (unadjusted) within the HRPT reader, and the red gridlines are at 15 and 20 degrees North and 95 and 100 degrees West. The image is from SAA raw data, NOAA-14, 2000 December 14 at 22:59 UTC.